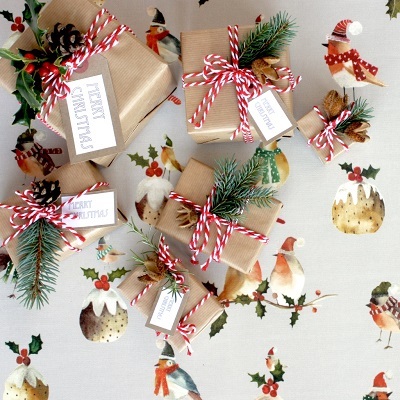 The Latest News | Wipe Easy Tablecloths - CHRISTMAS WRAPPING - NATURALLY! Are you looking for an original way to wrap up your Christmas presents this year? We really like the combination of recycled brown paper with fresh green Christmassy foliage, finished off with jazzy red and white butchers’ twine. Why not take the kids out foraging before Christmas to collect all the fresh materials. We’ve used fir, holly, rosemary, pinecones and beech nut cases. To keep any foliage fresh, put it in water and leave the fir cones on a radiator to encourage them to pop open. You can also use fresh rosemary from the supermarket for a fragrant touch. Any difficult shaped gifts can be put in a box to make them easier to wrap up. Using a roll of brown paper, wrap up your presents in advance, tie up with the butchers’ twine and add the labels. To attach the fir cones, use fine wire or a hot glue gun. Then on Christmas morning, just slip the foliage under the twine, and there you have it! Humble brown packages turned into nature inspired, festive gifts.